The importance of deep mixing in driving the deep part of the overturning circulation has been a long debated question at the global scale. Our observations provide an illustration of this process at the Timor Basin scale of ∼1000 km. Long-term averaged moored velocity data at the Timor western sill suggest that a deep circulation is present in the Timor Basin. An inflow transport of ∼0.15 Sv is observed between 1600 m and the bottom at 1890 m. Since the basin is closed on its eastern side below 1250 m depth, a return flow must be generated above 1600 m with a ∼0.15 Sv outflow. The vertical turbulent diffusivity is inferred from a heat and transport balance at the basin scale and from Thorpe scale analysis. Basin averaged vertical diffusivity is as large as 1 × 10−3 m2 s−1. 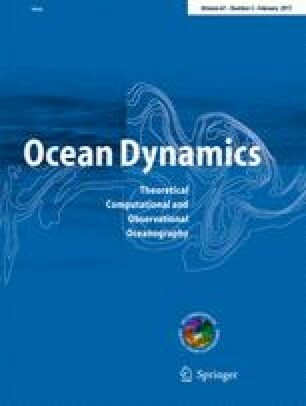 Observations are compared with regional low-resolution numerical simulations, and the deep observed circulation is only recovered when a strong vertical diffusivity resulting from the parameterization of internal tidal mixing is considered. Furthermore, the deep vertical mixing appears to be strongly dependent on the choice of the internal tide mixing parameterization and also on the prescribed value of the mixing efficiency. Model experiments were performed using HPC resources from GENCI-IDRIS (Grant 2010-011140).